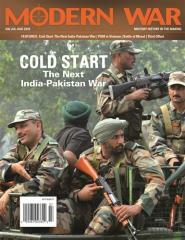 #36 "Cold Start - The Next India-Pakistan War, PGM in Vietnam, Battle of Mosul"
Product Line: Modern War Magazine - Magazine Only! Cold Start - The Next India-Pakistan War: The Indian government unveiled its current “Cold Start” war doctrine for use against Pakistan on 28 April 2004. The new strategic plan is to be used in response to Pakistani acts against India, including proxy wars or terrorist attacks supported by, or otherwise linked back to, Islamabad. Dawn of Precision Warfare - PGM in Vietnam: Precision bombing was well-publicized during the 1991 Gulf War, but the history of these weapons did not begin in the Middle East. They got their first test in combat during the Vietnam War. Battle of Mosul: Mosul had fallen to the Islamic State in 2014. In October 2016, a US-led coalition began its offensive to retake the city. Third Offset - Warfighting for the 21st Century: Analysis of the Third Offset Strategy and its influence on the future of warfare.